Pommes Dauphinoise Gratin comes from the Dauphine region of France. It differs from Pommes Dauphinoise, which are deep fried choux pastry made with mashed potatoes. 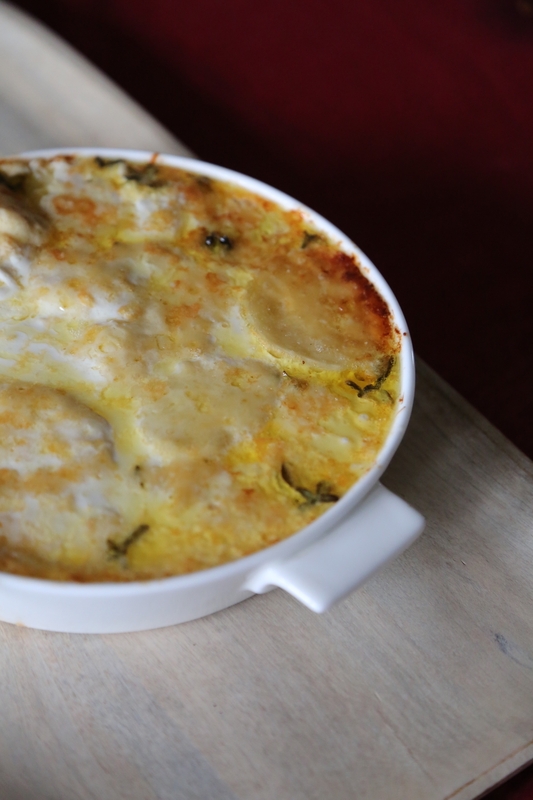 Traditionally the gratin version is made with very finely sliced raw potatoes layered and baked in cream. Slicing potatoes this fine requires a mandolin, which is not always available. Here I depart from tradition and parboil the potatoes before I bake them. This ensures the potatoes cook through in the oven.The addition of cheese and eggs varies in chefs' accounts. I do not use eggs but I do use cheese. This vegetarian dish is served with some variety of roast meat. You could also serve it with the Lentil salad recipe in my cookbook An Indian Sense of Salad (Penguin). You will need ideally an 8 inch square or round that is.5 inches deep. You can also use a 9 by 13 but you will get less layers. Peel the potatoes and slice them into rounds about 1/4 inch thick. Place them in a wide and deep pan with the garlic, nutmeg, milk and cream and bring to a slow boil. As soon as it reaches a boil switch off the flame and using a slotted spoon remove the sliced potatoes from the liquid and put them on a plate. Do not over cook the potatoes. They must be soft but also keep their shape when baked. Using tongs arrange potatoes in layers in a gratin dish. Add salt to the leftover cream and milk and adjust for taste. Stir in a little white pepper. Pour over the layered potatoes. Use a soup to make sure all the potatoes are well steeped in the liquid and bake in the oven for 35 minutes. Open oven and scatter the Gruyere cheese over the gratin and broil until golden brown. Heat a large saucepan of water on a high flame. When it reaches a boil immerse the cauliflower florets in the boiling water. Let sit 2 minutes, then drain completely. Wash the cauliflower in cool running water and drain completely. Combine the lime juice, coriander leaves, green chillies, turmeric, garlic ginger paste and salt. Toss well to coat all the florets. and let sit covered 20 minutes. In a mixing bowl combine the ingredients for the batter. Using a tablespoon add the flours and spices to the cauliflower 2 tablespoons at a time. Stir well. Allow the flours to absorb the liquid in the florets. Keep adding flour until it clings to the cauliflower. Add water if required a tablespoon at a time. Do not create a wet runny batter. 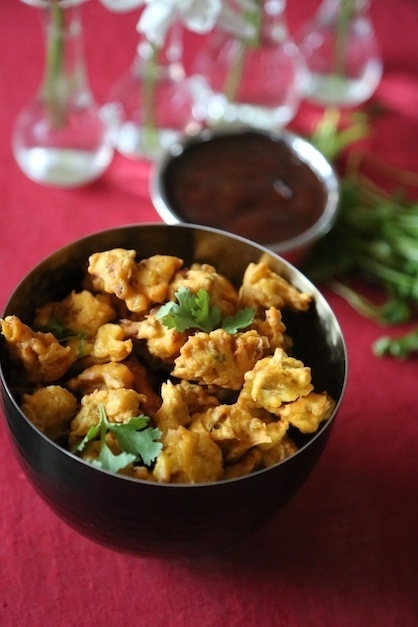 You want the pakoras to be crispy. The more water you add the more oily and soft the fritter will be. Stop adding the flour once you have a thick sticky, clumpy batter. Taste for seasoning and adjust. Heat 2.5 inches of oil in a small kadai or wok on high heat. When oil is hot but not smoking reduce flame to medium. Fry one pakora until golden brown. Drain and taste for doneness and salt. Adjust salt in batter if required. Repeat with remaining fritters. 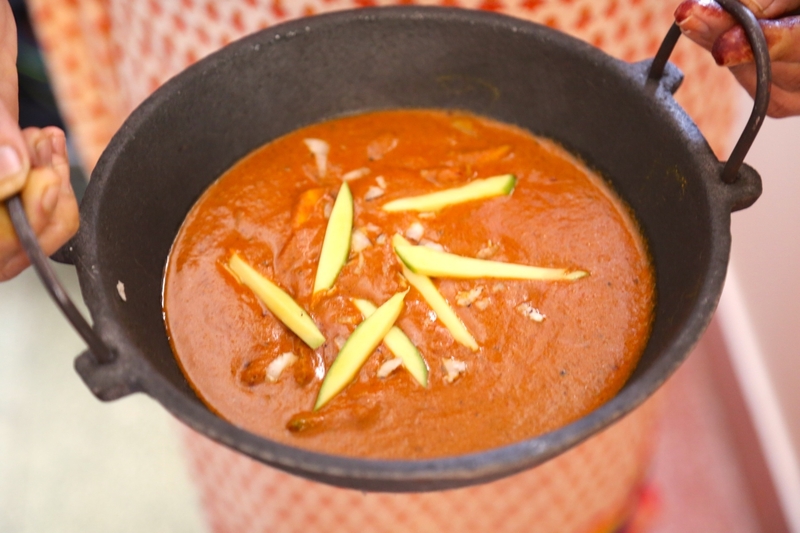 Serve warm with ketchup or a chutney of your choice. HEAT THE MILK AND WATER IN A LARGE SAUCEPAN UNTIL IT REACHES A BOIL. ADD THE UNCOOKED MACARONI AND COOK STIRRING FROM TIME TO TIME UNTIL MACARONI IS AL DENTE. STIR IN THE CHEESES AND MIX UNTIL WELL COMBINED AND THE CHEESE HAS MELTED. SWITCH OFF FLAME AND SEASON WITH SALT AND PEPPER. SERVE HOT. 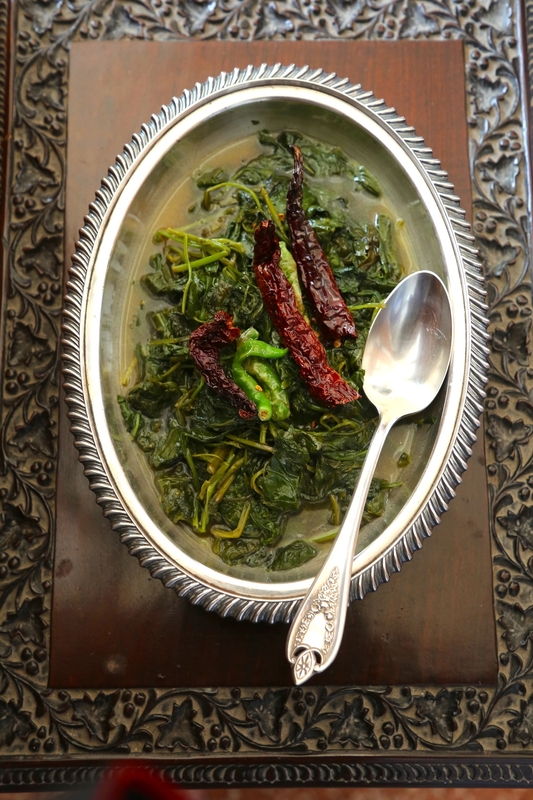 USAL IS A TRADITIONAL SAUTEED VEGETABLE RECIPE FROM MAHARASHTRA. IN KONKANI IT IS CALLED UPKARI. 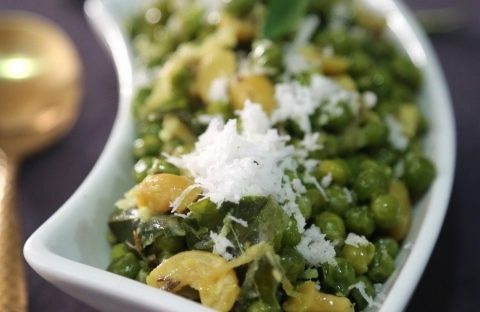 THIS USAL IS SATVIK-PREPARED WITHOUT ONIONS AND GARLIC AND IS OFTEN MADE DURING GANESH CHATURTI AND OTHER RELIGIOUS FESTIVALS. IT IS DELICIOUS WITH A FLATBREAD LIKE PHULKA OR WITH RICE AND YELLOW LENTILS. HEAT THE OIL OR GHEE IN A MEDIUM SKILLET ON A HIGH FLAME. ADD THE CUMIN SEEDS AND SAUTE 1 MINUTE. ADD CURRY LEAVES, GREEN CHILLIES AND ASAFETIDA. SAUTE 30 SECONDS. ADD THE PEAS AND STIR WELL. ADD TWO CUPS OF WATER, TURMERIC A TEASPOON OF SALT AND COOK UNTIL PEAS ARE DRY AND TENDER. ADD MORE WATER IF REQUIRED. SQUEEZE LIME JUICE OVER THE COOKED PEAS. 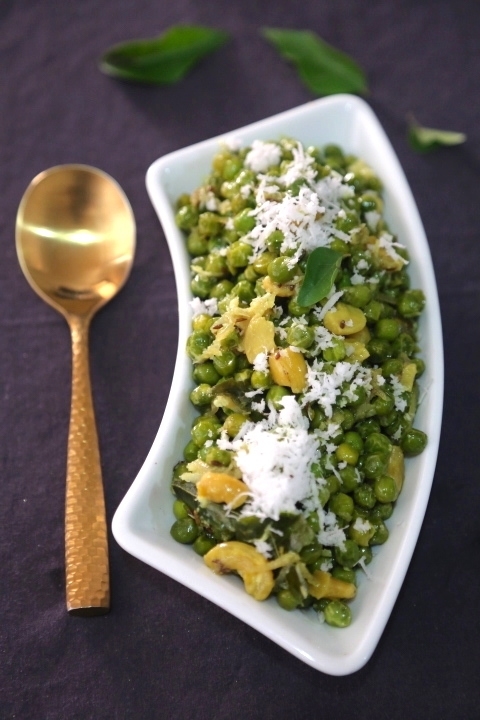 TOSS WITH COCONUT, CASHEWS AND TASTE FOR SALT BEFORE SERVING AND SRI IN CRUMBLED JAGGERY IF MORE SWEETNESS IS REQUIRED. This is a recipe from our family friend Aunty Eva which I tweaked a bit over the years. 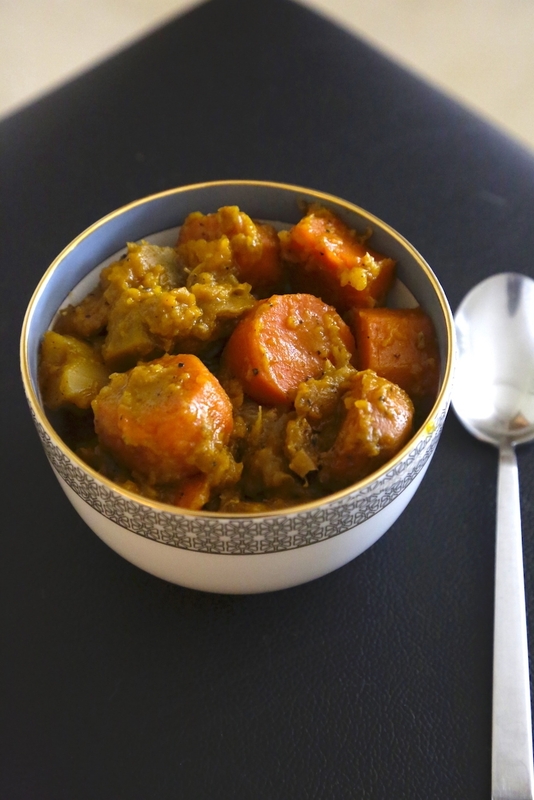 Tsimmes is a chunky Ashkenazi vegetable stew ideal for Passover with brisket or before the Yom Kippur fast when you want something filling. Kerala where the community of Cochin Jews have resided for centuries has many traditional vegetable stews like the famous Avial. 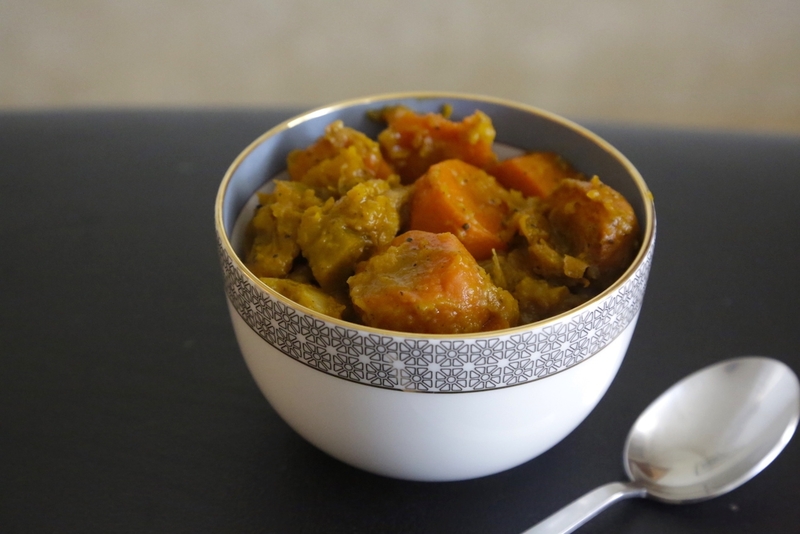 This stew has a delicate hint of spice and uses tamarind instead of orange juice. In a large (10- to 11-inch) ovenproof pot heat the vegetable oil, add the star anise, sambhar or pearl onions and red chillies, and sauté over medium heat for 10 minutes, stirring occasionally, until onions are a light golden colour. Add the carrots and saute 5-6 minutes. Add the carrots, sweet potatoes, pumpkin, stock, ginger, tamarind juice, ghee or butter, turmeric, nutmeg, 1 tablespoon salt, and combine. Bring the liquid to a simmer on top of the stove until. vegetables are just tender but not over cooked or mushy. Stir carefully, taste and adjust for seasonings, and serve warm. I BEGAN MAKING THIS RECIPE 6 YEARS AGO FOR THANKSGIVING AND IT HAS EVOLVED AND CHANGED OVER TIME- SOMETIMES I USE MINT INSTEAD OF DILL AND CRANBERRIES INSTEAD OF APRICOTS. 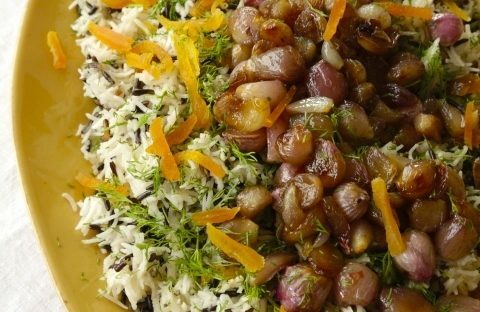 THE BASMATI MAKES A WONDERFUL CONTRAST TO THE TEXTURE OF WILD RICE. YOU CAN ALSO USE FLAVORFUL RICE LIKE KOLAM. WILD RICE IS A GRASS SEED THAT COMES FROM A DIFFERENT GENUS THAN ASIAN RICE. THERE ARE 4 SPECIES THAT ARE GROWN IN THE AMERICAS, INDIA AND CHINA. IN THE UNITED STATES IT WAS NOT FARMED BUT TRADITIONALLY HARVESTED BY NATIVE AMERICANS FOR WHOM THIS ANCIENT FOOD HOLDS GREAT SYMBOLISM. SINCE IT GROWS WILD IN LAKES AND SMALL BODIES OF WATER NATIVE AMERICAN TRIBES LIKE THE OJIBWA WOULD PADDLE TO THE WEEDS IN CANOES AND GENTLY 'KNOCK' THE SEEDS FROM THE GRASS. SOME SPECIES LIKE TEXAS WILD RICE ARE ENDANGERED BECAUSE OF LOSS OF HABITAT. I USE MINNESOTAN WILD RICE BECAUSE MY HUSBAND IS FROM MINNESOTA. NOW THAT THIS RICE HAS BECOME POPULAR IT IS BEING FARMED IN PADDY FIELDS IN CALIFORNIA AND MINNESOTA AND CULTIVATED WILD RICE IS VERY GOOD. BUT AT THANKSGIVING I SPLURGE AND BUY HAND-HARVESTED AND WOOD PARCHED WILD RICE THAT'S ABOUT 6 TIMES THE PRICE OF CULTIVATED WILD RICE. YOU CAN ALSO BUY IT ONLINE BUT READ THE CAPTIONS CAREFULLY. HAND HARVESTED ON CANOES IS WHAT YOU ARE LOOKING FOR IF YOU WANT THE TRADITIONAL WILD RICE. THIS RICE IS A BEAUTIFUL BLACK WITH A SUMPTUOUS MEATY TASTE AND CHEWY TEXTURE THAT VEGETARIANS LOVE. WILD RICE NEEDS A LONGER COOKING TIME THAN BASMATI SO THEY SHOULD BE COOKED SEPARATELY. HEAT 2 TBSPNS BUTTER AND THE VEGETABLE OIL IN A DUTCH OVEN STYLE POT. ADD THE ONIONS AND SAUTE ON A VERY LOW FLAME, STIRRING FROM TIME TO TIME UNTIL ONIONS ARE TENDER, STICKY AND CARAMELIZED. THIS WILL TAKE 25 MINUTES. YOU CAN DO OTHER WORK IN THE KITCHEN AS THE PROCESS ONLY SPEEDS UP IN THE LAST 5 MINUTES. TOWARDS THE END ADD THE MAPLE SYRUP AND STIR THE ONIONS GENTLY ESPECIALLY IF YOU ARE USE PEARL ONIONS. USING A SLOTTED SPOON REMOVE THE ONIONS AND RESERVE ON A PLATE. IN THE SAME POINT ADD REMAINING BUTTER AND THE WILD RICE. ADD 3 CUPS OF WATER AND 2 TSP SALT. COOK ON HGH HEAT UNTIL WATER HAS MOSTLY EVAPORATED. ADD THE BASMATI AND STIR GENTLY TO COAT IN OIL. ADD 4.5 CUPS OF ROOM TEMPERATURE WATER, COVER AND COOK UNTIL RICE IS ALMOST DONE. SWITCH OFF FLAME AND ALLOW IT TO COOK IN ITS OWN STEAM FOR 2 MINUTES. TAKE OFF THE LID, FLUFF THE RICE WITH A FORK AND LET IT BREATHE ABOUT 10 MINUTES. STIR IN HALF THE DILL AND HALF THE APRICOTS AND ADJUST FOR SALT. 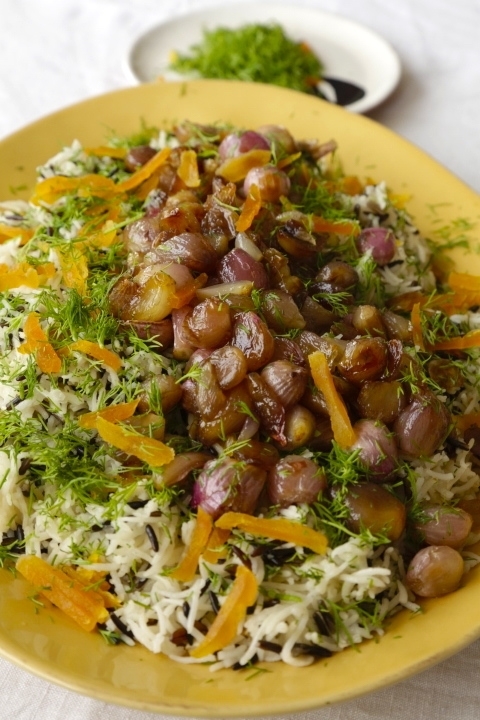 TOP WITH CARAMELIZED ONIONS, REMAINING DILL AND APRICOTS. SERVE WARM. This recipe came to me from chef P Saravanan at the Taj Coromandel in Chennai. This delicious red masala pomfret melts in your mouth and is very easy to prepare. 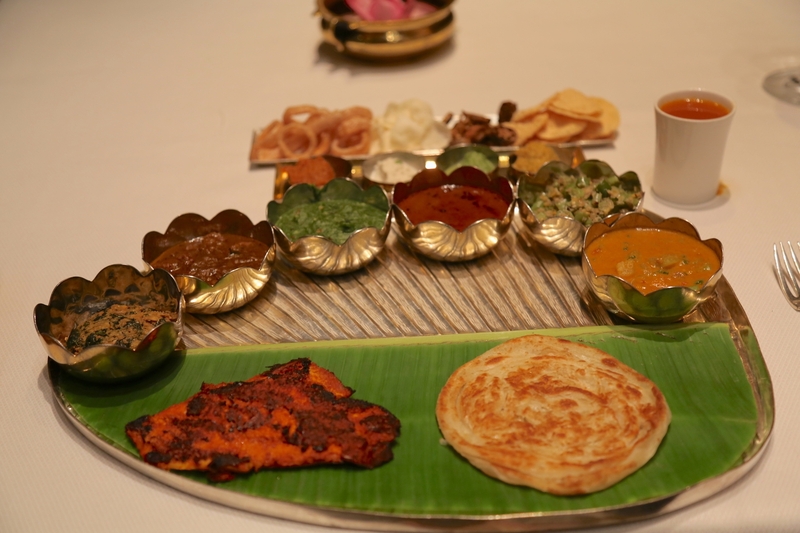 Shown in the photo on the left of the paratha. •	Wash the fillets and pat them dry with paper towels. Brush with turmeric and lime juice. Cover and reserve. •	Using a mortar and pestle macerate the dry chillies, shallots, peeled garlic, black pepper, curry leaves and tamarind pulp in a bowl. •	Sprinkle water and grind the mixture to a smooth paste. •	Apply the spice paste to the pomfret fillets. Cover tightly and refrigerate 1 hour. •	Preheat a griddle and sprinkle oil on it. Gently place the marinated fish fillets on the griddle and cook till both sides get an even brown color and the fish is cooked though. TOAST THE RED CHILLIES, BLACK GRAM, CORIANDER, CUMIN, FENUGREEK SEEDS IN A DRY PAN ON MEDIUM ABOUT 3 MINUTES. COOL AND GRIND TO A FINE POWDER. ADD THE COCONUT, TURMERIC AND GREEN CHILLIES AND GRIND TO A SMOOTH PASTE. ADD A LITTLE WATER IF REQUIRED. HEAT OIL IN A PAN ON A HGH FLAME. ADD MUSTARD AND FENUGREEK SEEDS. THEN ADD BLACK GRAM SEEDS AND ASAFETIDA. COOK ABOUT 1 MINUTE UNTIL THEY SIZZLE AND RISE TO THE TOP. ADD THE GREEN MANGO AND 1 CUP OF WATER. SIMMER UNTIL MANGO PIECES ARE SOFTENED. ADD GROUND COCONUT MASALA AND SALT TO TASTE. ADD JAGGERY IF REQUIRED. GARNISH WITH A FEW RAW SLICES OF RAW MANGO. SERVE WITH BOILED WHITE BASMATI RICE. A great way to use leftover egg whites. These candied nuts are excellent in salads, with hot fudge sundaes, as a cocktail appetizer and a snack when you feel like grazing. Mix the nuts with the egg whites in a large bowl. Stir in remaining ingredients and mix thoroughly. 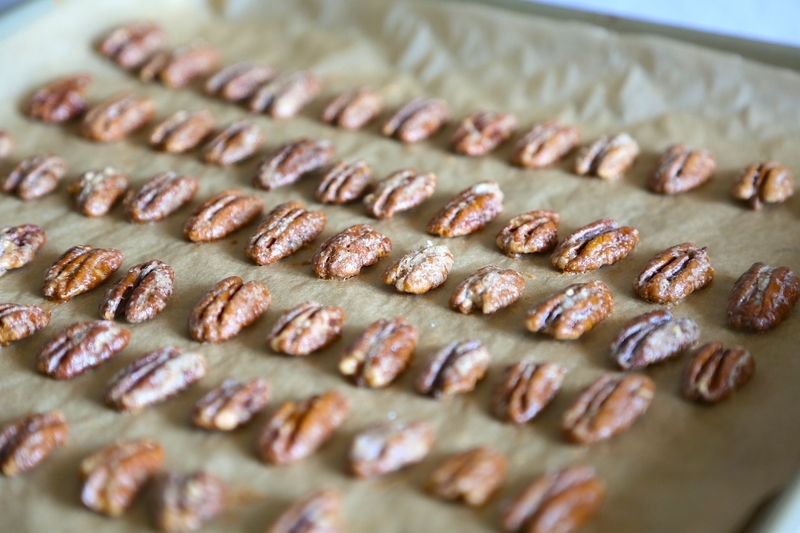 Lay out the nuts one by one on the parchment lined trays. Bake 25 minutes or until golden, fragrant and crisp. Cool completely and refrigerate in airtight boxes, bottles or zipped bags. Keeps for several weeks -if you can resist them!